ani M INTERIORS provides high-end interior design services, sourcing the best quality furnishings and finishes to delight its clients. That said, it is a bespoke service that doesn’t need to cost the earth. ani M INTERIORS is able to achieve amazing results on a reasonable budget as the recent project at Dickens Yard demonstrates. 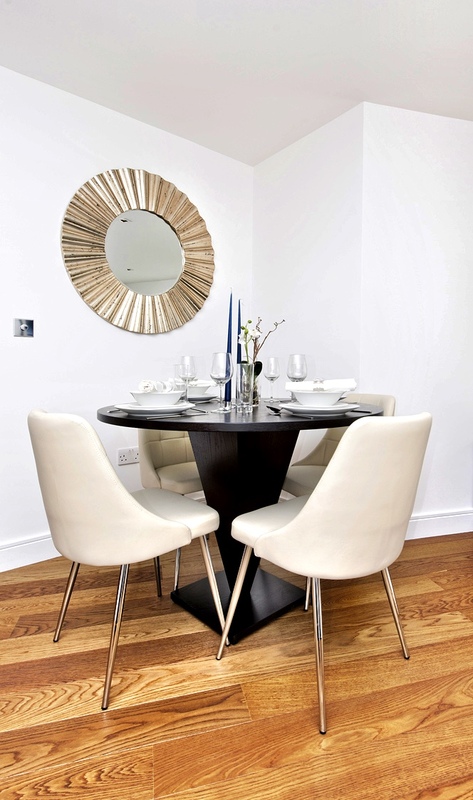 Fitzroy Apartments, in the heart of Ealing, is a modern complex of one and two-bed apartments. An overseas client wanted their two-bedroom, two-bathroom, balconied property to be furnished and dressed to a high standard on a budget. Not a problem for the ani M INTERIORS design team. The first consideration was the size and shape of the reception area. 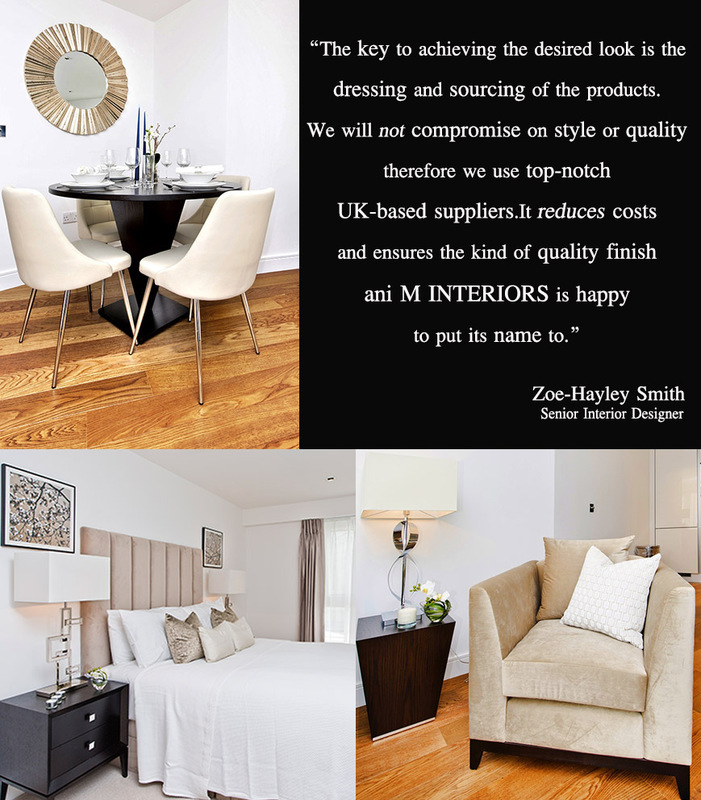 Senior Interior Designer on the project, Zoe-Hayley-Smith, comments: “One of the challenges was to ensure the furniture did not overpower the room. Positioning and proportion was key due to its angular shape.” She selected a three-seater couch and beautifully curved occasional chair to help the area appear more spacious. Velvet upholstery gives the reception area a sumptuous feel, while the use of ready-made, pre-treated, fire-retardant furniture is a clever cost-saving measure. 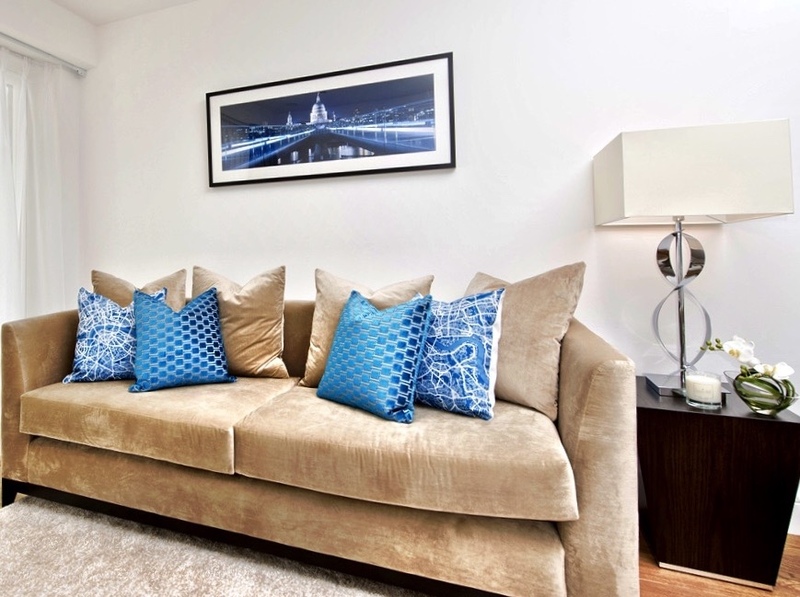 The client had requested a subtle ‘London’ theme, so Zoe tastefully picked out soft furnishings featuring the London Underground and used a framed print of Millennium Bridge as a focal point in the room. In the reception area, a curious alcove provided the perfect place for a circular dining table that can seat four. The alcove could have been a cause for concern in the hands of a less skilled designer but Zoe found a functional solution for the space and the choice of a circular table offset the alcove’s shape wonderfully. The bedrooms received the same care and attention to detail. Upholstered vertical panel headboards added a great focal point while statement lamps and other well-chosen objects add interest. A neutral palate creates an air of calm and when combined with finishes such as velvet, mirror and glass, the rooms feel light, spacious and most of all luxurious. The neural palate is carried through both bathrooms to harmonise the space. Rich, dark oak wall paneling and a marble sink surround bring a touch of gravitas to these rooms. Similarly, the kitchen is sleek and neutral with a few touches such as a highly polished work surface and splash back that gives it the wow factor. The property is outstanding and completed for a reasonable budget. Luxury and beauty doesn’t necessarily come with a huge price tag, thanks to the skill and research of ani M INTERIORS experienced interior designers.